iBall has launched iBall Aasaan 4 feature Phone in India. The Aasaan series phones are targeted at senior citizens. The company says that the Aasaan4 focuses on the holistic needs of seniors with a bigger screen. 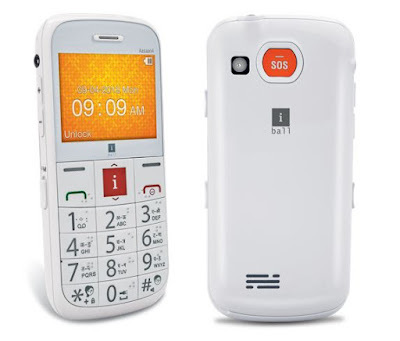 iBall Aasaan4 comes with unique features like ‘Braille & Talking keypad’ for the visually impaired as well as mobile tracker which alerts one of the predefined family members once the new SIM card is inserted. It sports a 2.31-inches display with large dialling keys. Users who are not conversant with Braille can activate the talking keypad feature that speaks out the digit pressed in English. The Aasaan4 rocks an SOS feature which will come in handy when users want to get help during emergencies. Once the SOS button is set off, it will alert the people nearby and also sends SMS to 5 predefined numbers. It comes with Medicine reminder and Hearing Aid feature allows conversations with better clarity. It packs a 1800mAh battery, Dual SIM, support for up to 32GB storage through microSD. It also comes with built-in FM Radio, chambered speaker and also supports 10 Indian Regional System languages and also multi-Indian Regional languages with ‘Read and Write’ support for SMS. The iBall Aasaan4 is priced at Rs. 3,499 and is already available offline.